Do you dream of experiencing the magic of Paris? Does your idea of the perfect evening include a visit to a Parisian carnival and circus show? If so, you won’t be able to get enough of Cirque de Cheval, the breathtaking video slot machine from Novomatic. In the vein of Book of Maya, Book of Stars and many of the developer’s other casino games, Cirque de Cheval takes you on a magical journey to a distant land, capturing the childlike wonder hidden within. The characters in Cirque de Cheval are represented by animals from an old-fashioned carousel. You’ll find a speedy pink ostrich, a dazzling aqua dragon, a majestic unicorn, a dashing rabbit and a bouncy frog. There are also letters and numbers, each designed to match with the Parisian theme. A number of other special symbols add to the complexity of game play and increase your chances of winning big. If you love other Novomatic video slots, such as Sizzling Hot, Book of Ra Deluxe, Lucky Lady's Charm, Cleopatra and Dolphins Pearl Deluxe, this game should be right up your alley. It offers many of the same great features, including autoplay, which allows you to spin the reel continuously without having to be at the gaming window. 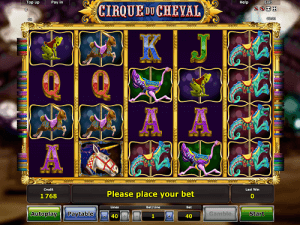 However, unlike some of the other games, Cirque de Cheval offers 40 pay lines to strategize with. Between that and the other unique features, this is sure to become one of your favorite Vegas-style video slots. To begin, use the controllers on the bottom of the gaming window to pick the number of lines and betting amount that you would like to play with. When you’re ready, hit start. This will spin the reel and reveal your symbols. If you get a lucky win, you’ll be given the option to either accept your earnings or gamble with them. Are you a risk taker? Those who love pushing things to the limit will get a kick out of the free game hidden within Cirque de Cheval. After a win, hit the gamble button to open a new gaming window. Here, you’ll be able to choose between red or black. A card will be drawn, and if you get a match, your winnings will double. You’ll then be given the chance to either gamble again or accept your winnings. Sometimes, risking everything pays off, but others, it causes you to lose everything. You should be sure to choose wisely! The carousel: A matching stack on reel one and the carousel anywhere on reel five will trigger the carousel feature. The entry ticket: If you get a stack of entry tickets on reel one and a carousel on reel five, you'll win free games! The Cirque de Cheval: The banner for the circus serves as the wildcard for this game. It substitutes any other symbol aside from the ticket and carousel. When you get four matching symbols on the first reel and a carousel symbol on reel five, all of the reels will begin moving to the right. They will shift between one and four spaces at random. The new symbols that appear will match those that were originally on the first reel, creating a large block of matching symbols. This can help you win big, so it’s impossible to not feel excitement as you watch the reels begin to move. Seeing a stack of entry tickets on reel one is awesome, but if you also see a carousel on reel five, it’s really time to celebrate. When fortune shines upon you and these two circumstances occur at once, the reels will begin shifting to the right. They’ll shift a random amount, exposing more entry tickets. When the reel stops moving, you’ll be left with 12, 16 or 20 entry tickets, and this will determine how many free games you can play. If you love Cirque de Cheval, you’ll be excited to try similar games. Be sure to check out Katana, Magic Princess and Columbus. With so many great Novomatic casino games, you won’t have to go far to schedule and fun and entertaining evening. Why pay the money to travel to Vegas when you can experience similar entertainment from the comfort of your home? Enjoy these fun games, and be sure to tell your friends about the greatness of Novomatic!